In Granada, one of the most impressive building projects of the Middle Ages has begun: the construction of Alhambra. A palace, fortress, and a small city - all-in-one - Alhambra is made up of the world's most beautiful gardens, pavilions, chambers and towers. Build the most splendorous Alhambra to be crowned the winner! This is an updated, rethemed version of Stimmt So!. It now involves tile-laying and has an Arabian theme. Best of all, it just won the Spiel des Jahres for 2003! Alhambra Game Review by "Weird"
I need to start out by saying, I have never played Stimmt So, so I can not compare the two games. I was excited to get this game because it won SDJ game of the year, this year. The components are nice, the boards and tiles are made of a heavy grade, they didn't skimp on this. The cards could have been a little better stock and the coating could have been better, but they are not bad. It comes with a bag to draw random tiles from, this could have been a bit bigger, when full you can't mix them up much. I know that we have gotten very picky about our games, but I think this is a good thing. You setup the game by putting the score board and the building yard in the center of the table. Every player receives a reserve board, two wooden pieces (one to show your color and one for your score) and a starting tile (A fountain). Players take money, one at a time, they draw cards until they have 20 or more in value. this means everyone hopes for a 19 and then draw a 9. It's a nice way to randomize the money start. After everyone has drawn money, the rest of the money is split into 5 stacks, the first score card is shuffled into the second stack, the second score card is shuffled into the fourth stack, after that, they are restacked (5 stack on bottom, fourth next... Next four tiles are drawn form the bag and placed on the building board. The last thing is, draw four money cards and place them face up next to the building board. Now you are ready to play. A player can do one of three things a turn. 1: Buy and place a building from the building yard. The yard has four slots, one for each currency, the cost is on each building. You can only buy the building with the kind of currency listed for that slot. You do not get change, but if you have the exact amount, you get another turn. If you don't have a valid placement, you can put the building in your reserve yard. For placement, you must place all tiles in the same direction ( roofs up), you must be able to reach every building from your main tile and walls must be built nest to walls (or the wall must be on the outer edge. 2: Pick up one of the four money cards. You can change your Alhambra by doing one of three things. remove a tile and put it in your reserve, place a tile from reserve on your Alhambra or swap a tile from your Alhambra with one of your reserve pieces. All placement must be legal. At the end of your turn you fill the tiles and money to four again. When the first score card is drawn, the person with the most buildings of each color (reserve tiles do not count) gets points, in the first round the points are from 1-6. When the second score card is drawn, the person with the most of each color gets points 8-13 second place scores 1-6. The third score is when the last tile is drawn from the bag, the tiles left go to the person with the most currency of each type. First to third place scores 16-21, 8-13 and 1-6. In each scoring round, all players get a points for the length of longest outer wall in the Alhambra, one point for each section of the longest wall. Why did I wait so long to play this? It's easy to learn; No complicated rules and no little rules you have to look up all the time. There's only a small amount of luck and a lot of strategy. I like how the turns move pretty quickly so there's no lag time between moves. I might grow to like this as much as I like Ticket to Ride. 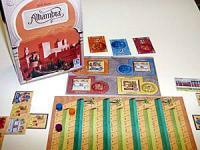 Alhambra is a strategic game of buiding an alhambra(city, town). You purchase tiles to build your alhambra, but be careful not to buy tiles with too many walls, or your doomed to wall yourself in. This is a game that you have to watch your moves as well as your fellow players because you gain points by having the most gardens, towers etc. at the end of the three rounds. Can't wait to play again. Build your own Spanish castle/fortress – an Alhambra – with up to 6 players. You compete for money to buy different rooms, gardens, pavilions and fountains to expand your castle. The player with the highest scoring castle at the end of the game is the winner. This game is easy to learn, and doesn’t take too long to play (about 45 minutes). The game pieces are colorful and high quality. Just because a game says it will support up to 6 players doesn't mean that it will support them well. Stick with 5 or fewer. Nice gave of set collection mixed with tile laying. But unlike something like Carcassonne, each player gets to build their own little kingdom, so you can do it however you like without anyone messing you up. This can be great for people who prefer less confrontational games. In fact there is virtually nothing that is overtly offensive. If you ever grow tired of the base game and want more, there are loads of expansions to choose from. Alhambra finds an excellent balance between keeping you involved, making you make strategic decisions, and still remaining fairly simple the whole time. If I've got a group of people who I'm afraid won't get into the more serious and heavy style games, this is my go-to game. Quick to explain, and fun to play, Alhambra is a much-played game at my house. Alhambra is a great game for 2-4 players, and we always forget how much fun it is until we bring it out. It is compact, easy to teach and fun to play. Always a win! Once the game arrived my 7yr old daughter and I couldn't wait for the rest of the family to play it. Since she's a BIG Settlers of Catan fan I thought this was a perfect match. Easy game play and attractive tiles made the game fun and enjoyable immediately. A great game for 3 or more players. This is a very nice tile-laying game that can be played by anywhere from 2-6 players. I particularly like the mechanic of getting an extra turn when you pay exact cash for a tile, since it adds both unpredictability and an incentive to deviate from the obvious choices of actions. A great euro-game. Similar to Carcassonne in that you're building a city, only everyone gets to build their own. There's money management, tile placement, and enough table-talk to keep you well occupied into the night. I often play games with my parents or my young children, which requires games that are not too confrontational but still allows some interaction. Alhambra fits the bill for this very well, in that it is mostly about your own efficiency at building and managing your money, but it also has subtle ways of messing with your opponent (through your choice of tiles). It is a great family game that I believe can be enjoyed by almost anyone. Great tile placing game, light yet strategic enough that it's worth having. Classic. Great tile placement and card management game. The scoring system is unique and allows points for 2nd and 3rd. The only confusing thing is having colors for the money and the building type. Simple game play allows for easy integration of new players.